It’s kind of my favorite right now. 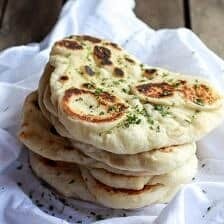 Full of all my favorite flavors and SO easy to make. I make a lot of recipes… wait, not a lot, A TON, and it’s rare that I’ll make a recipe more than twice. 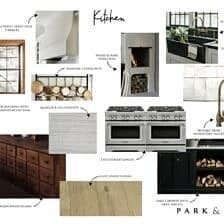 It’s not because I don’t love each and every recipe that I tell you guys about, it’s just that new recipes need to be made, tested and eaten… you know? That said, I have a handful of recipes that I do fall back on when family parties come up or we have people coming in to visit OR on the rare occasion when I just need a quick dinner and there’s nothing already made in the fridge. Pasta salad is one of those recipes. It seems I make it different every time though. Whenever I make a pasta salad, it normally consists of the odds and ends that are in my fridge. Think leftover sauces, dressings and vinaigrettes… roasted veggies, herbs and of course cheese! Always a different combo, but yet somehow always delicious. Weird how that works, huh?? Anyway, the last pasta salad I made was one for the books. Literally, I mean, it was just SO freaking good, and it took me ten minutes to throw together. Any recipe like that is always a winner to me. Plus, when my brother told me he took the leftovers with him on his road trip back to LA, and that even after siting in the warm car it was still amazing, I knew the recipe needed to be shared. But um, I don’t recommend the warm car thing…that’s probably not a good idea. OK, so this is how this Basil Goat Cheese Pasta Salad goes. Start out by roasting up some beets, which I am slightly beet obsessed with these days, I just cannot get enough of them. While the beets are roasting, boil some short cut pasta and then toss the hot pasta with the goat cheese and a little basil vinaigrette. YESSS. Tossing the hot pasta with the goat cheese is key here, as the pasta melts the goat cheese and makes for a creamy sauce. Seriously. 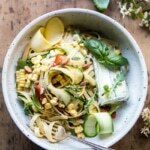 Now just add a bunch of raw zucchini, watercress, summer squash and corn (if you are a newbie to raw corn you have to give it a try, it’s so flavorful and sweet!). Then toss everything together with those roasted beets. So simple, right?!?! Not going to lie, you guys should probably make this for dinner tonight AND on Memorial Day next weekend. Trust me, it’s going to become your go-to summer pasta salad! 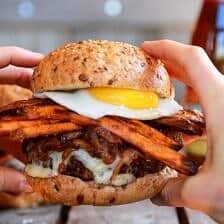 What would you guys have titled this recipe? I went back and forth between so many names. Keep it short and simple like the recipe? Add some of the key ingredients into the recipe? 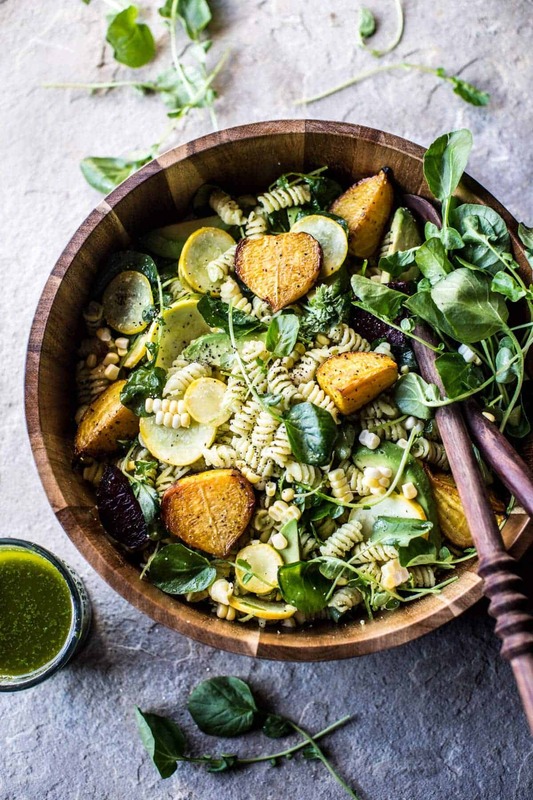 Call it a Spring Pasta Salad? 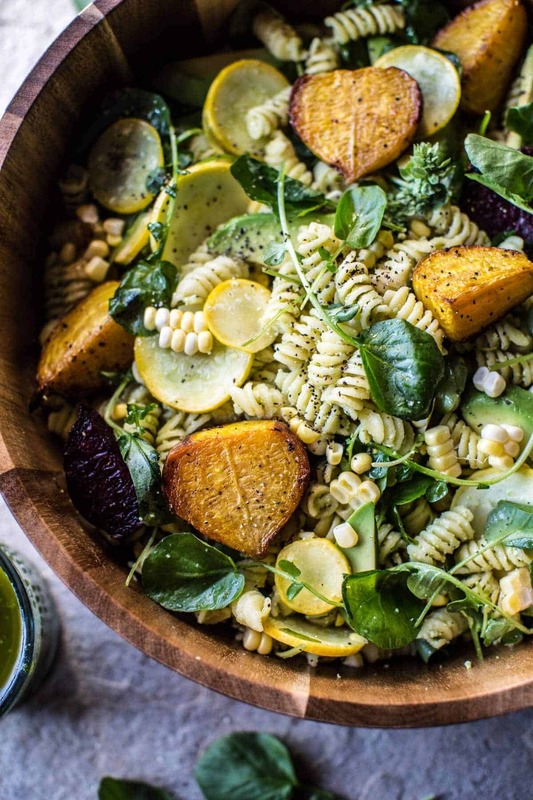 Call it a Summer Pasta Salad? Like what? So many options!! Goat Cheese, Roasted Beet and Basil Pasta Salad. Trust me, it’s going to become your go-to summer pasta salad! 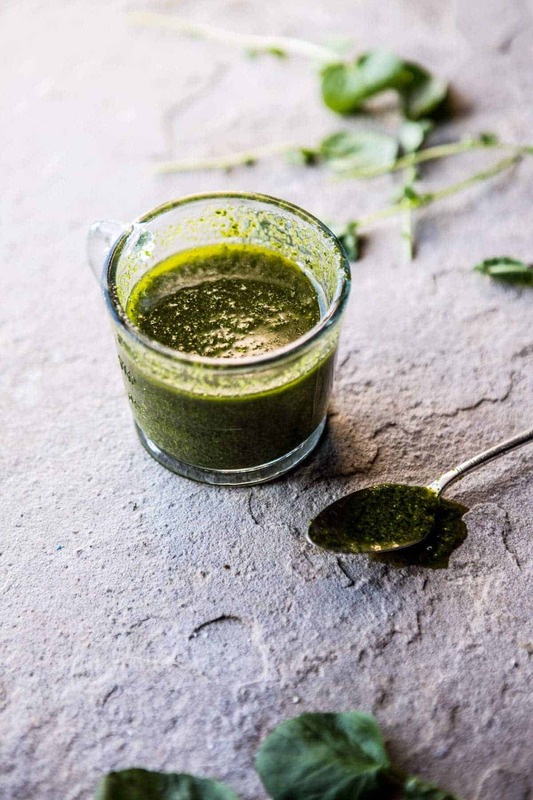 In a blender or food processor, blend the basil, olive oil, lemon juice, vinegar, garlic, 1 teaspoon of the salt, and a pinch red pepper flakes until smooth. Taste and adjust salt as needed. Toss the beets together with the olive oil and a good pinch of both salt + pepper. Spread the beets out in an even layer on a baking sheet. Roast for 25-30 minutes or until the beets are tender and charred on the edges. Meanwhile, bring a large pot of salted water to a boil. Boil the pasta until a dente. Drain and add the pasta to a large serving bowl. To the hot pasta, add the goat cheese and couple large spoonfuls of the basil vinaigrette, toss well until the goat cheese coats the pasta completely. Add the yellow squash, fresh corn and watercress and toss to combine. 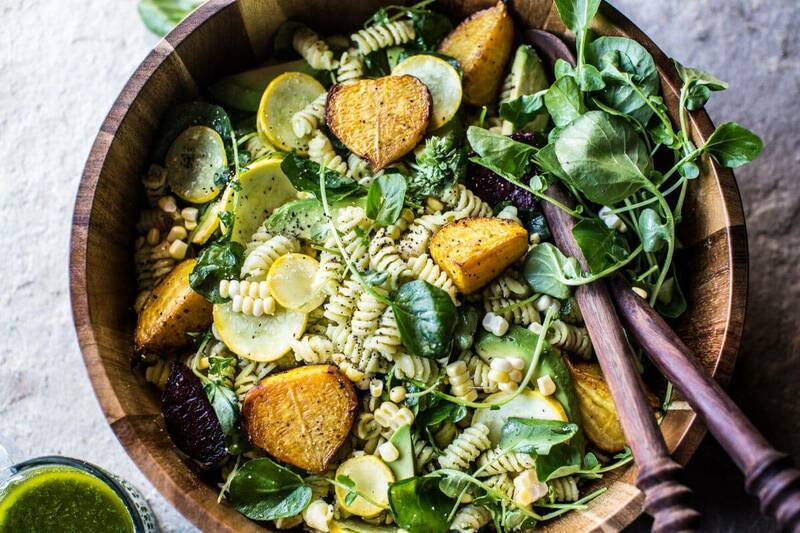 Top the pasta with the roasted beets and avocado. Serve the remaining vinaigrette on the side. 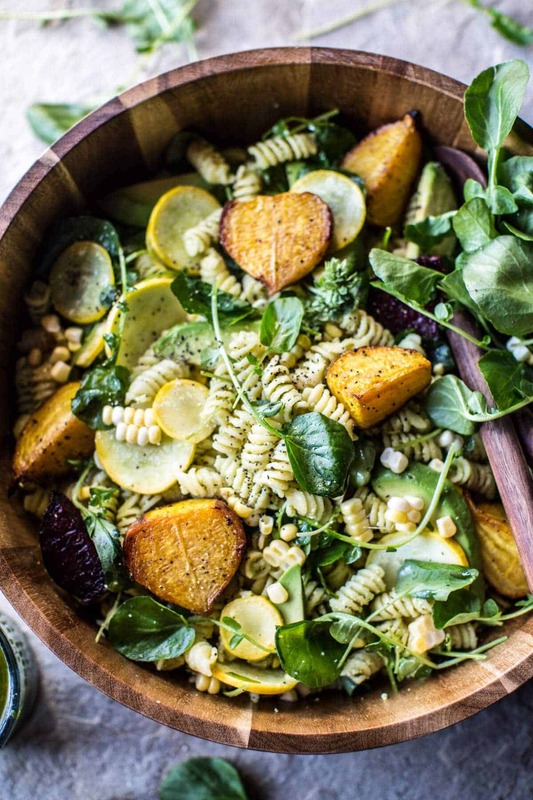 This pasta salad is gorgeous! 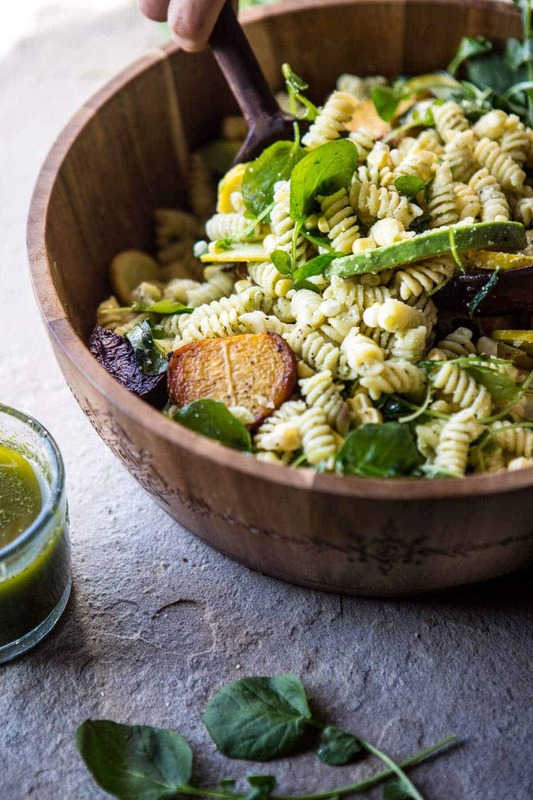 It has pretty much all of my favorite ingredients: pasta, avocado, corn…and oh lawdy—that basil vinaigrette! I must make this! Yup yup agree. Never have eaten yellow beets before. Gonna mix summer squash and green zucchini in this bad boy. And too be fancy, was thinking about using the zucchini flowers on top to spice up my boring life. Whaddya think? Great salad!! YES YES! Sounds so good!! Let me know how it goes!! Thanks!! AH yes! Hope you love it Rachel!! Thanks!! You had me when you wrote goat cheese. And pasta. And avocado. I mean: yummy! The recipe looks easy and extremely good! And the pictures.. well, they are just beautiful! Haha! YES! Hope you love it!! And Thank you so much!! I had no idea those were beets… I thought that was fried goat cheese! In any case, this salad looks, indeed, amazing… But why is everyone talking about avocado?? There’s no avocado in here, right?… As for a name, I’d go with the ingredients. Short and simple. Avocado is listed in the ingredients. I had to go back and look. HA!! Yup, there is actually avocado in this pasta. Thank so much for the kind words and let me know if you have any questions. Thanks! How perfect!! Let me know if you like it!! Thanks Erika! Had it for lunch today, soooooo good ! A lovely salad , you could call it a a creamy goat cheese salad with a basil vinaigrette and roasted beets. Thank you!! Name totally works as well!! I really don’t think we should talk about this pasta salad, I think we should just eat it!! Haha! Agreed!! Hope you love it Miranda!! GOAT CHEESE IS LIFE. add it to anything and I’m there babe – love this T! So agree! Its the absolute best! Thanks a ton Christine!! 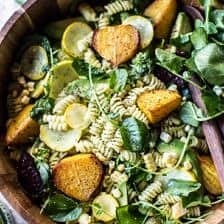 I’d call it “Warm Beet, Basil, and Goat Cheese Pasta Salad.” Because I couldn’t tell it had beets in it until I read your post and I love beets so that is such a game changer! Also the fact that it’s served slightly warm and doesn’t need to sit/chill in the fridge is a plus. I like!! The beets make it for me as well! Thanks Sara hope you love it! Beauiful and delicious. My mouth is watering and I’m dreaming of how delicious this salad is going to be. Thank you so much Celeste! Hope you love it!! Oh there will be many pictures!! 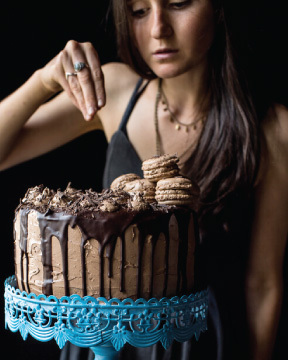 I am 100% making this tonight. Thank you, Instagram. YES! So happy! Thanks Brooke! Do you have a sign up process for your wonderful recipes? HI! Yes, I do! You can sign up to get new emails sent to your inbox on the left hand side of my site. If you have any trouble finding it, let me know. I can also just add you myself if you would prefer. Thanks! Yum! 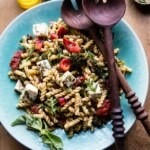 I love a good pasta salad and this looks simply amazing T! 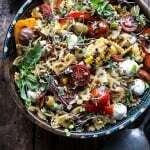 This pasta salad looks totally gorgeous and delicious! A few questions though: for the zucchini and yellow squash, do you cook them before adding them to the pasta? Also, what is the difference between feta and goat cheese? In my house growing up the terms were always interchangeable, but I’m thinking that’s just not the case? For me doing a recipe several times is completely normal. When I fall for one I just can’t help it! Maybe this one will get a new favorite one of mine too! I hope so!! That would be awesome!! WHAT ARE THE TWO DEEP RED “OBJECTS” IN THE SALAD PHOTOS ??? DID YOU SNEAK IN SOME RED BEETS, TOO ??? Yes there are red beets too!! I just wanted to drop a line to say this was amazing. We made it tonight and so hit the spot. The raw corn was so sweet with a little crispness. This is definitely going to be on the menu for the summer. Thanks for a great recipe! YAY! SO happy you liked it!! Thanks for commenting William! Just want to say that I’ve seen some beautiful food photography in my day, and I’ve made a lot of food as well…but you have serious talent! 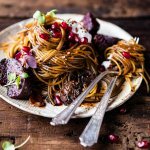 Amazing recipes on the blog, stunning pictures. SO impressed by you. I’m following you for sure now! Keep it up! WOW!! Thank you Elizabeth! Thats so so nice! (: I hope you like everything to come!! This sounds delicious! Added it to my family’s meal plan for the week. Question – do you serve hot or recommend chilling in the refrigerator? Hey Samantha! You can eat this warm or cold. I like it warm, but I just prefer warm foods! ? let me know if you have any other questions. Thank you! 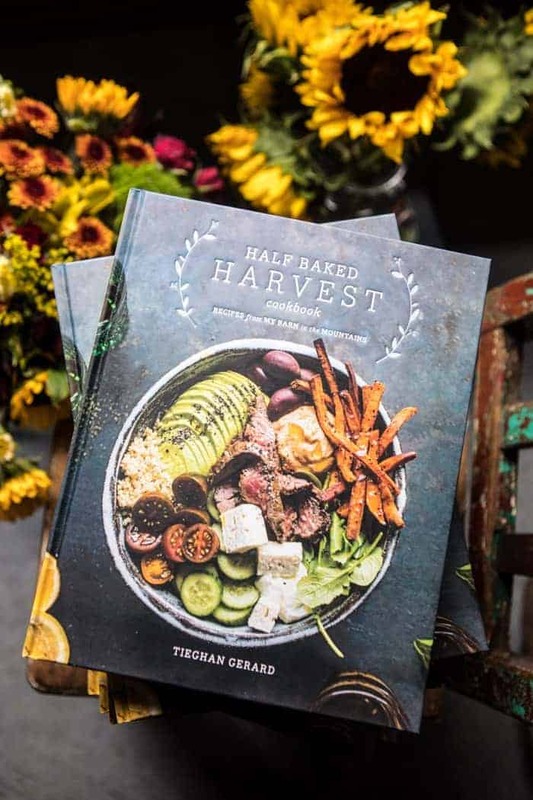 Tieghan – you are a godsend and so talented. Every food item I prepare from your blog tastes like heaven. Definitely making this Sunday! I made this as a side over the weekend with Steak on BBQ. WOW! A lighter salad, fresh, healthy, tasty, YUM! great flavor & gorgeous presentation. I was never really one for beets, but i gotta say, your changing my mind on them. them roasted is really great. This salad screams spring/ summer. Wooohoooo!! Thats awesome! So happy to help change your mind!! So happy you liked it!! Thanks Karen! 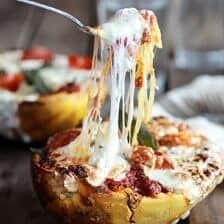 Any recommendations for another type of cheese to substitute for goat? I would use feta, burrata or mozzarella, but honestly any cheese you really love will work. Let me know if you have questions. Thanks! 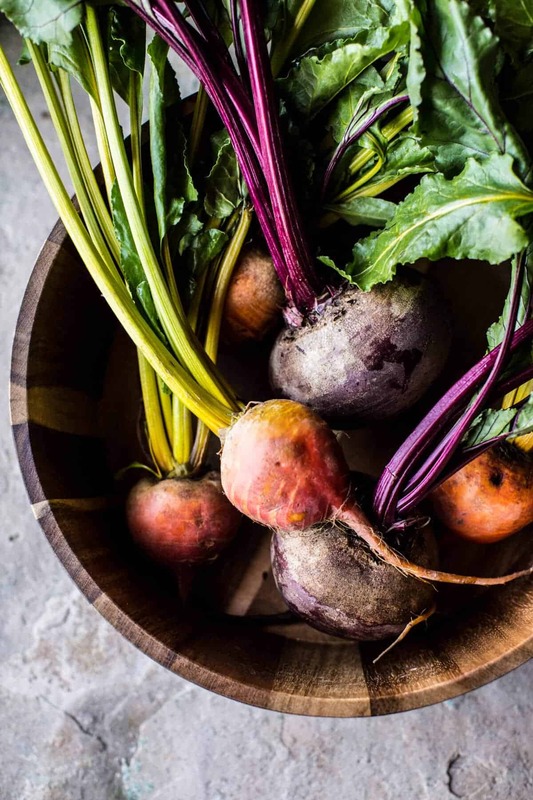 Hi, for the beets – do I peel skin off before roasting? Or do I roast with skin and then peel it off? Or eat with skin? Sorry so many beet skin questions! Thanks! Hi, for the beets – do I peel skin off before roasting? Or do I roast with skin and then peel it off? Or eat with skin? Sorry so many beet skin questions! Thanks so much! This is seriously fantastic! I did zest the lemon before juicing. I just love lemon zest! The flavors in this recipe are scrumptious!